What is mindfulness? Have you heard this word everywhere lately and wondered what it means? It is the ability to identify what your emotions are telling you in the moment. It is to be present in the moment and knowing what is going on in your mind and body. But how do we get there? Where do we start? Let’s talk about one tangible way, with something we do many times a day — eating. What is mindful eating? Mindful eating is bringing awareness and practice to your meal times and food choices. It is looking for the reasons you want to eat and identifying if there is true hunger or if there is something else within you that needs fed. Are you really hungry for a snack or are you just feeling lonely and reaching out to a friend would give you what you need? Mindful eating is noting when your body is full and satisfied and stopping without cleaning your plate; and knowing that it is okay to stop. Below are my top three tips for bringing mindfulness to your eating habits, so that you can start to listen to and understand your body’s cues. 1. Gratitude. I believe that truly appreciating the food we eat and being grateful for its nourishment to our bodies is critical to being mindful. One of my favorite exercises is to start at the grocery store. I focus on being aware of and grateful for the farmers that grew the food I am buying. It means I am being grateful that I have options and can choose to purchase food that is really nutritious. Then I take that gratitude into the kitchen. As I am cooking the food, I focus on that same gratitude to the farmer. But I take it a step further and focus on being grateful that the food is going to nourish and sustain my body and give it the fuel it needs to continue throughout my day and week. Then while I am eating the food, I bring that gratitude even more personal. I envision my body itself being grateful that I am feeding it such nourishing food. When you bring this level of gratitude to the food you eat, there is no choice but to be mindful. It makes you mindful in your purchases; mindful in your cooking; and finally mindful in your eating. 2. Slow Down. Slow down and pay attention to your body. This one can sometimes be difficult because we have lost touch with our body. Eat slower. Take short breaks. Ask yourself if you are still hungry or still full. Slowing down allows us to pay more attention and once we get the hang of it, we are more clear about when we are full and about knowing when to stop. Once we can listen to those cues, we can begin to make better choices about when, where, how much and what we eat so that we feel better about all those choices. 3. Set the Table. I mean really set it! Use the good china or dinnerware. 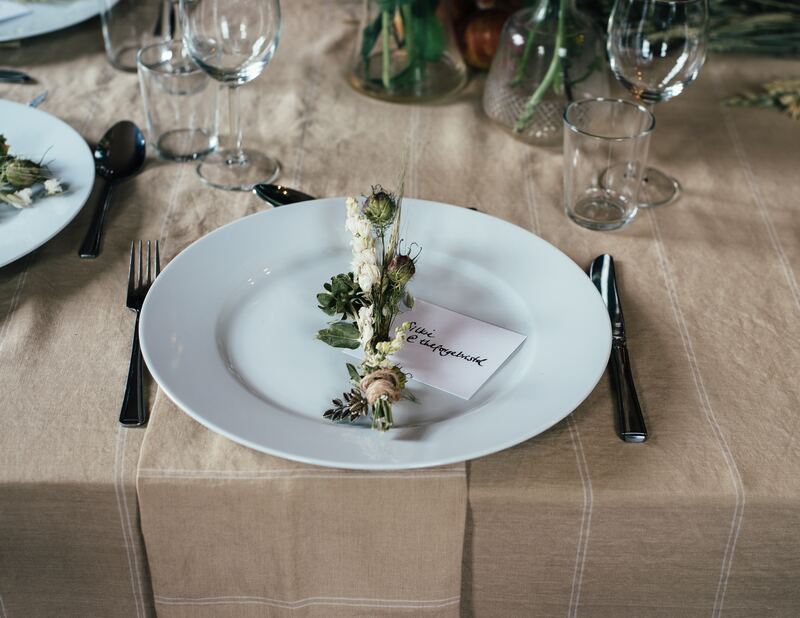 Make your place setting look pretty with the silverware properly placed and a cloth napkin. You might add some fresh flowers to the center of the table. Really go all out and give yourself a beautiful, peaceful setting for your meal. Make eating an experience of beauty, without stress, only a sense of ease. When you sit down to eat, make sure you don’t have any distractions. No phone, no tv, no books. Set aside the time for just you and focusing on your food and your body. When I practice this habit of taking the time to set the stage, and then really enjoy the whole experience it allows me to really tune into mindfulness. Giving myself permission to walk away from the distractions of life for just 20 minutes, to enjoy a meal that I have prepared with gratitude, and to nourish my body with good food is really helpful in making me feel satisfied. Using mindful practices like this really support us in bringing the mind, body and heart to our eating. This really can help us transform our nutrition habits to a place where we make better choices and eat food that fuels us rather than satisfies us short term. Being mindful allows us to eat when we are hungry and stop when we are full. It can support us in losing weight, having more energy and being healthier without diets and restrictive meal plans. It isn’t about a diet. It isn’t about restrictive eating. It isn’t even about counting calories. It is listening to your body and giving it what it really wants and needs. That may be that it wants some leafy greens. Or it may be that it wants a hug and some companionship. Or it may want you to take some quiet time and relax. When working with my one-on-one clients, I find that mindful eating is often one of the first things we address because it is so easy for us to get in a habit of eating by rote with no thought for what, how much and when we are eating. With my support, my clients learn to eat mindfully, which results in them eating better, feeling better and managing stress better and overall have a healthier life. They often lose weight without feeling like they’re on a diet; have “good” or “bad” foods, or feeling restricted. Sherry Parks is a Wellness Coach who helps career women escape feeling trapped and out of control in their work life, so that they are happy on their own terms and have joy and excitement for their life. To connect with Sherry, join her women-only Facebook group Lives in Balance.